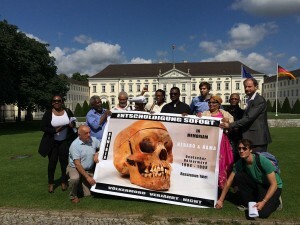 Zum ersten Mal bringt der zivilgesellschaftliche Kongress Schwarze, weiße und afrikanische Menschen in Deutschland mit bedeutenden Nachfahren der Opfer des Genozids an den OvaHerero und Nama 1904-1908 zusammen, um über die Voraussetzungen transnationaler Versöhnung zu diskutieren. Unter den Gästen sind langjährige Mitglieder des namibischen Parlaments wie Ida Hoffmann, renommierte Herero-Aktivist_innen wie Esther Muinjangue und traditionelle Autoritäten wie Vekuii Rukoro. The congress will bring together, in solidarity and common purpose, Black, white and African people in Germany with descendants of the victims of the Ovaherero and Nama genocides 1904-1908 from all over the world including Africa, Europe and the Americas. Inviting hosts of the congress will be Berlin Postkolonial in cooperation with AfricAvenir International, the Ovaherero/Ovambanderu Genocide Foundation (OGF), the Nama Technical Committee on Genocide, the Association of the Ovaherero/Ovambanderu Genocide in the USA (OGA), the OvaHerero/Mbanderu and Nama Genocides Institute (ONGI), and the German NGO Alliance “No Amnesty on Genocide!”. to reflect on the past struggle for restorative justice for the Ovaherero and Nama genocides. to evaluate recent developments and the present situation in Germany and Namibia with regard to the exclusion of Ovaherero and Nama from the genocide negotiations. to affirm the right of the Ovaherero and Nama communities to be directly involved in negotiating a comprehensive solution, including recognition of the genocides, a sincere apology and just reparations for the genocides. to chart a course for transnational actions to secure restorative justice and the repatriation of all Ovaherero and Nama human remains shipped to Germany. The congress will begin on Friday, October 14 at 2:00 pm and conclude on Sunday, October 16, at 1:00 pm. It will conclude with a march through Berlin on Sunday morning. The congress will be held at the Centre Francais, 13349 Berlin, Germany, Müllerstraße 74. The associated Hotel de France promised to offer single & double rooms for Oct 14 & 15 at a congress rate: www.hotel-francais-berlin.de, phone: +49(0)30 417 29 0. For questions and registration please send an email to buero(at)berlin-postkolonial.de. Please register no later than September 14 and include your full name, affiliation, and telephone number.